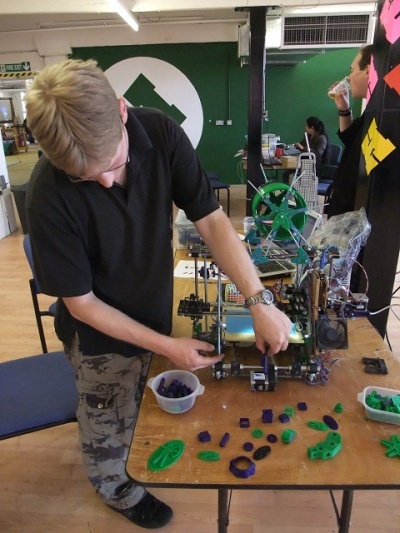 On Sunday 29th May 2011 we held the first Big Open Day Event as a celebration of the new Hackspace "2.0" and a publicity/recruitment opportunity. It was a great success, attracting many visitors and new members. 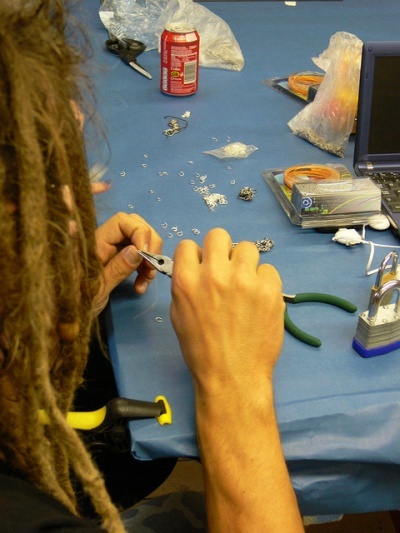 Guests were invited to attend from other Hackspaces and the event was widely advertised locally & nationally. The day was split into two parts. 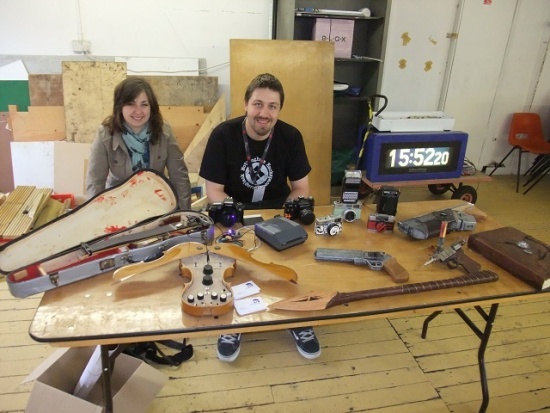 The 1st Part: Members, friends and guest of Nottingham Hackspace brought projects/items of interest etc to show to the general public. 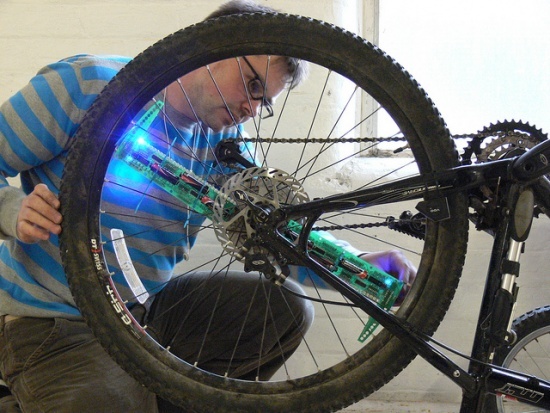 There were demos, presentations, and tours of the Hackspace. 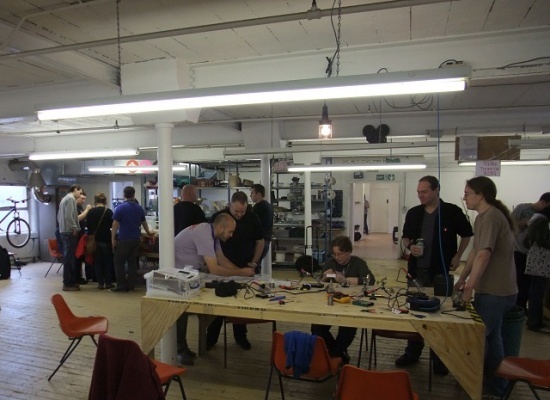 The 2nd Part The Hackspace Warming Party from 16:00 involved eating drinking & making merry. 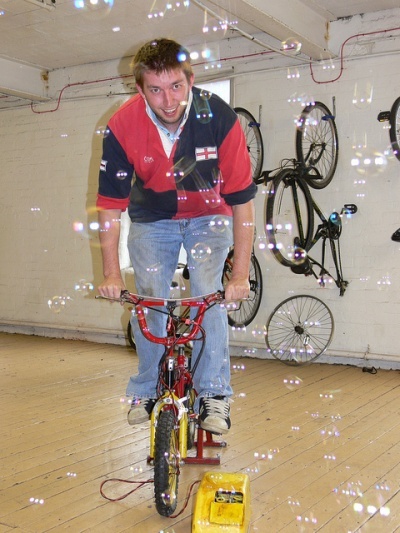 Matt Little (and others) demonstrated pedal-powered machines, bicycle hacks and unicycling. 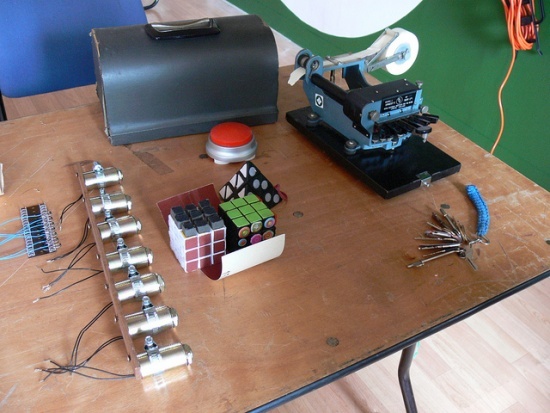 In the interactive area visitors had a chance to try lock picking, crochet, and chainmail making, and the knitting machine was on display. 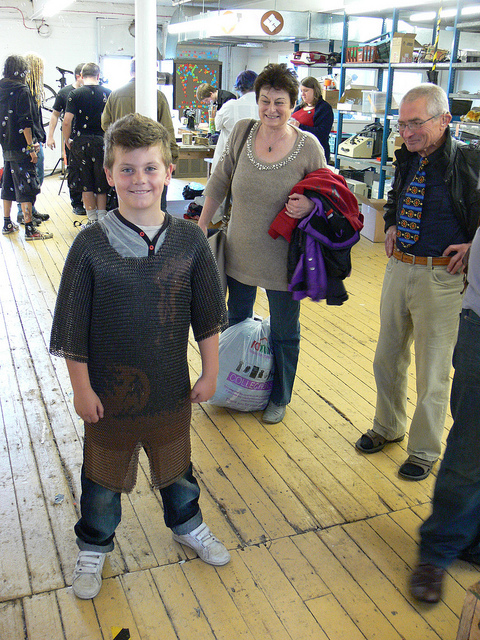 Visitors could try on chainmail. And there was also a chance to make chainmail. 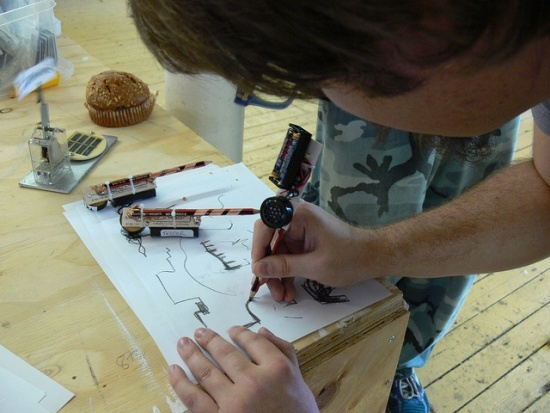 Nottinghack members and others from Northackton demonstrated their projects in the studio. 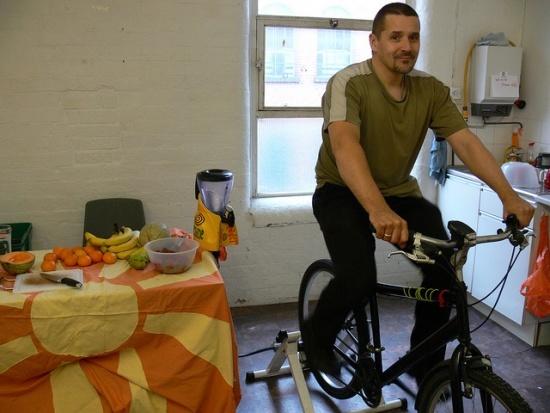 If you have good photos that were taken on the open day, please upload them and let us know. 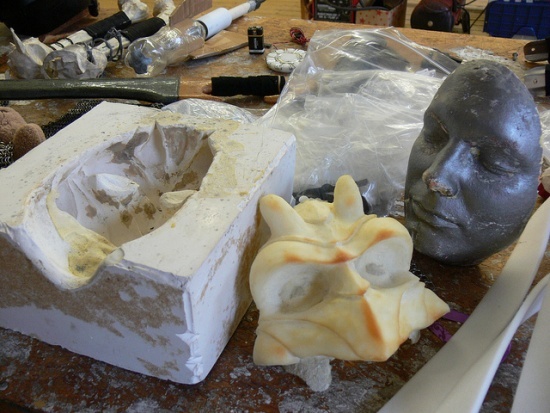 The open day gave us the impetus to get lots of things finished off. In addition to all the projects listed above, many people helped with preparation for the event. 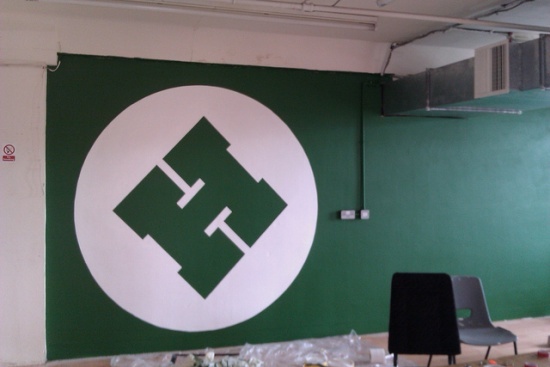 Tony_S finished painting the giant H, which has become a distinctive feature of the space. He also painted the signs outside by the Alfred Street door, and ones to point around the corner. James got extra drinks to stock up Snackspace. We (mostly User:Lwk) tidied up the blue room. 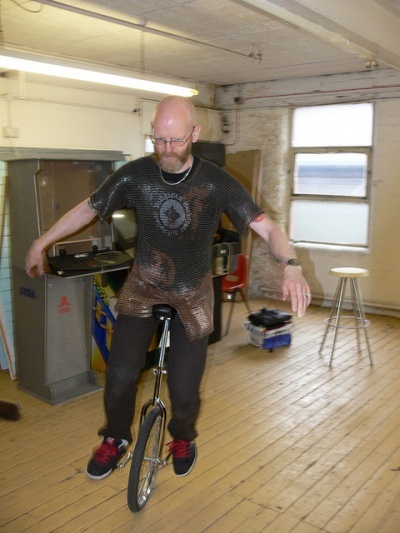 We tidied the tools and workshop (for once), mopped the floors and cleaned the toilets! 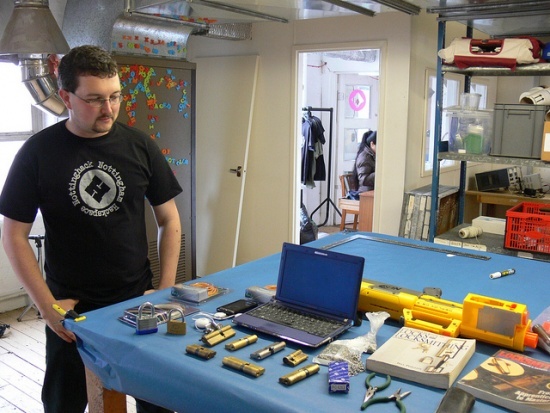 Blue: other Hackspace's friends and places we have visited. We installed the cinema seats. We got the LED matrix partly working (enough for a demo). Jake made some tags to be worn around necks, reading 'Ask me about membership', complete with the info on the back incase people selling the space forget. And Jake lent us his projector, which he later donated to the space. If you're name is not here then that's just because we didn't keep records. Thank you all! This page was last modified on 16 February 2019, at 09:05.